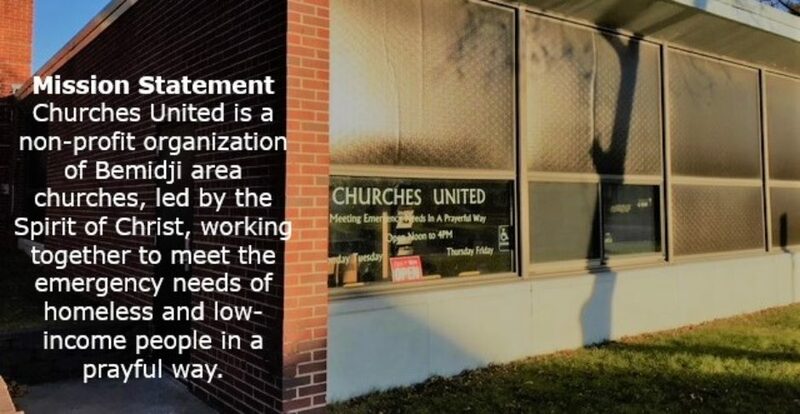 Churches United is a church guided ministry that provides emergency short-term assistance for those who need immediate help and have nowhere else to turn. Services we may provide include financial aid for: food, gas, rent, and utility bills. Our assistance extends to individuals and families through counseling and referrals to other community agencies and resources. There are three specific areas in which you can help Churches United transform the lives of those we serve. 2. Volunteering: We ask for just four (4) hours of your time per month. We have a job for you, no matter what your skill set is.If you like helping people, greeting people, filing paperwork, data entry, or just organizing the office; we have a job for you.